Rooting out evil requires a committed cadre of men joined with vision and a persuasion that binds their goals into a unified phaylanx of solidarity. G-MEN on guard for the good of our country. Clyde Tolson with his man would love to be a part of the war on terror. Terror would be worthy of their skills, having terrorized generations of Americans; with their efforts unleashed upon the infidel we would send Islamic Jihadis to quaver in the shadows, their dirty deeds would be put right by the dynamic duo. When J. Edgar said, "In for a penny, in for a pound" he meant no two-bit Muslim would stand a chance to become an evil doer under my watch. Imminent threats afoot but not to worry J. Edgar's Ghost is alive and well. Transformed from Cop to Spook just like J. Edgar would have done. If J. Edgar Hoover were here he would dress in his best drag toast with his close friend and confidant, Clyde Tolson and tear into the infidels. We do know this, if J. Edgar were Muslim he would love Sharia law and the Madina brand of Islam. He had leanings that many find disturbing but his heart was all American. With vision for the future J. Edgar issued an edict concerning Homosexuality and its possible negative effects to commerce. J. edgar would give constancy to a buearu that has had more directors than Quo Vadis. "I regret to say that we of the FBI are powerless to act in cases of oral-genital intimacy, unless it has in some way obstructed interstate commerce. when it comes to fighting the other, the dissident, the morally fallible, the enemy of American interests, the detractor to the American Way, J. Edgar Hoover with trusty sidekick would be on our side. With a character like J. Edgar Hoover, Alberto Gonzales would have one very big arrow in his quiver. Alberto Gonzales would have the freedom to tap and torture to his hearts content. Satisfaction for our President would be fulfilled and we, the public could stand by and watch as our constutitional rights are winnowed to the priveledge of having chips planted under our skin and tatoos on our foreheads to signify our station and status in this Classified Meritocracy. J. Edgar's character must be found to restore our national standing, reinvigorate business, breed larger famlies and spread the American Way round the world. When our national security is threatened by people like Emma Goldman or Ho Hama La Bini. J. Edgar Hoover, secret ceremony, 1968. 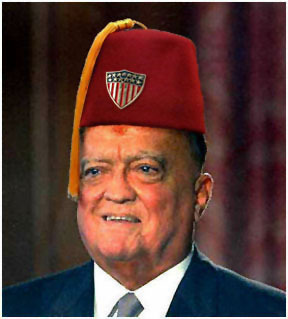 J.Edgar Hoover was a better closeted Muslim than homosexual. Little known for nearly seventy years, his devotion to Islam comes as a shock to many. J. Edgar was a passionate joiner. He loved to associate with many types, infiltrating groups and getting the goods and fileing it away for future use to further the cause. The cause: to sustain him in his role as Emminient Supreme Archon for the preservation of J. Edgar Hoover. J. Edgar in later years developed a pronounced zebibah or forehead elbow confirming ostentatious piety. * Forehead elbows: A callous appearing in upper center of one's forehead: a zebibah. A forehead callous demonstrating fealty appears after much prostration. A Forehead elbow (location, depending on slope of skull) appears after many years of prostration before Allah; a right of passage for the true believer. Forehead elbows are a simple signatory for one true believer to recognize another. The forehead elbow is just that, an elbow on one's forehead built over years of prostration to Allah. "When fighting terror, terror is the best weapon." When J. Edgar Hoover died in May, 1972, he left virtually the whole of his estate to his long-time companion Clyde Tolson. Tolson also took control of Hoover's considerable secret files. Tolson retired from the FBI and according to his friends, the only time he left the house was to visit Hoover's grave and go shopping. When Tolson died in April, 1975, it was reported that the FBI agents arrived at his house and removed all these documents. Clyde Tolson is buried with Hoover at the Congressional Cemetery in Washington. 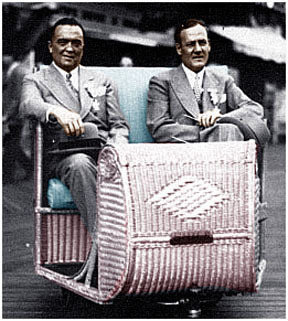 and J. Edgar Hoover, FBI joyride, Atlantic City. 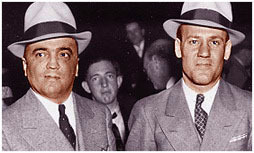 The joy of travel is but one of the percks for Clyde and J. Edgar Hoover. Between rooting out Communists and busting other miscrients, they loved to ride on the boardwalk in Atlantic City and troll in their prowler to the Georgetown Bar and Grill to lurk at heterosexuals and bag some rays..